As the name states, Estonia1918 is about Estonian design that is true to its heritage. All Estonia1918 are dedicated to the greatest Estonian people who have ever lived. The first model Wõitleja was dedicated to the brave men, women and children who fought in the War of Independence from 1918 until 1920 which they won. Latest model Maestro is dedicated to the best musicians from Estonia and the upcoming model Aviaator is going to be dedicated the aircraft engineers Post, Tooma and Org who created the Estonian PTO4. For the watches, we always prefer to use hand wound mechanical movements that can be seen trough an open caseback. Estonia1918 is an independent watch brand located in Tartu, Estonia, specializing in creation of high-end timepieces, underpinned by the philosophy of limited edition mechanical art. Each watch case begins its journey with a virtual stage, where it is developed using three-dimensional software (CAD) which guarantees its technical feasibility. It is then machined using numerically controlled (CNC) 5 axis machine in our manufactory in the center of Estonia. Each one of our timepieces is exclusive and exceptional, whether part of a limited edition or not. Each year we make no more than a few hundred pieces of any given model, even of our bestsellers. Estonia1918 focuses some attention on sophisticated hand engravings in movement parts, hands and cases. Each engraving is custom-made according to the desired motives by our Master Engraver Viljo Marrandi. As the Nicolas Hayek said: "We must build where we live. When a country loses the know-how and expertise to manufacture things, it loses its capacity to create wealth—its financial independence. When it loses its financial independence, it starts to lose political sovereignty." 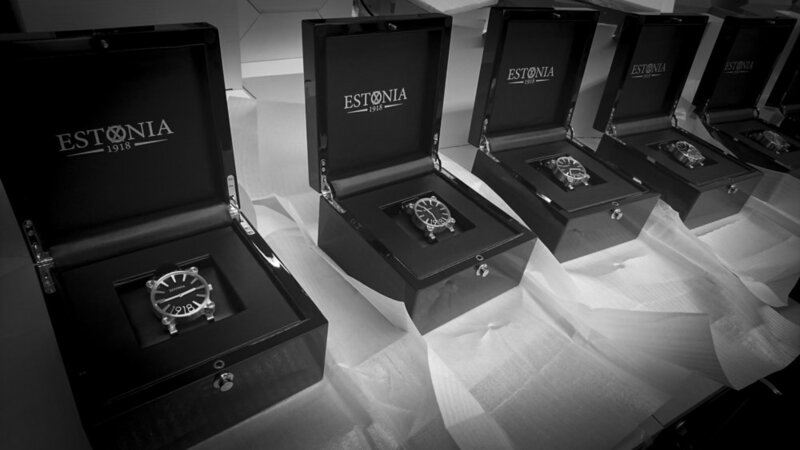 - that's exactly the reason why we choose to build our watches in Estonia. We are gradually building our know-how and will make more and more parts in-house. Uniqueness, art and design, and exclusivity are at the heart of Tõnis's creations. In 2017, Tõnis won a Silver prize at International Design Awards competition with a highly unique watch concept. The atelier of Estonia1918 is located in the center of Tartu, Estonia. At Raekoja plats 20, a house that was built in 1876 as one of the most secure banks of that era. All watches are built and kept in the secure vault of the former bank.